I’m re-blogging this today as I’m currently trialling Stihl’s latest addition to the compact cordless range, a cute little lawn mower, MA 235. It should really be given a pet name. It’s such a delight to use, weighing only 14kg, and with no cable to get wrapped around your legs and trip you up! It is perfect for small to medium lawns up to 200m2. The grass box capacity is 30ltrs, and the machine is extremely easy to use. I’m in favour of anything lightweight. I don’t have to ask anyone for help. Plus, being battery powered it is quiet. It doesn’t scare the cat, or the wildlife I’ve been so keen to attract to the garden. More photos to follow. I’ve been given these machines by Stihl in exchange for an honest review. All views are my own and if I say nice things about them it’s because I haven’t been pressured to do so. Here’s what I wrote about the other machines in the range, including hedge trimmer, leaf blower, trimmer and chain saw. All are interchangeable. Gardening is hard work-there’s no denying it. I sometimes think I must be mad to try to control an acre of ground. If I turn my back for five minutes the brambles are suddenly head high and thistles and stinging nettles look as if I’ve grown them on purpose. It’s not a sensible hobby for someone who has no muscles to speak of. I am five foot tall and weigh 8 stone. Then in addition, I have dodgy knees and a bad back. I really ought to take up sewing or knitting or…well, anything not requiring strength and stamina. But then, I have always been contrary. I never give up on a difficult task. I have only to delve into my family photo album to see where I get my streak of quiet determination. 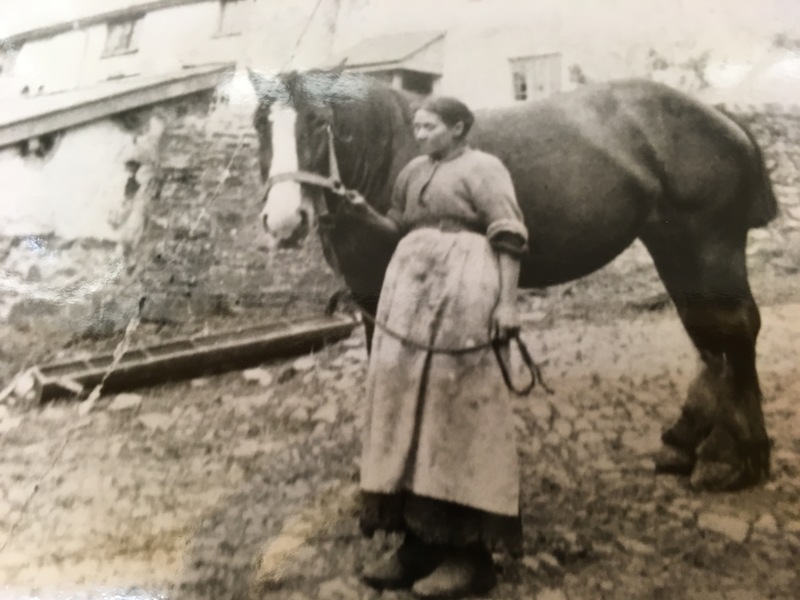 The oldest photos in the album show my great-great grandmother Charlotte Foxford, leading a shire horse down to the plough. There are pictures of her working the stony ground at the farm where she lived with her husband James in Oakford, Devon. She looks exhausted. And I want to step back through time and give them a helping hand- modern medicine, health care – and machinery. And yet, later in the album, I see them smartly dressed. Great-great grandfather James wears a suit and a jaunty hat. And I’m delighted to see them standing in the farmhouse doorway, with beautifully pruned roses around the porch. She had time to plant a garden- with all the cares she must have had to keep hearth and home together. And there are photos of them standing proudly next to the gleaming, well-groomed shire horses. Phew!They cared for their animals too. Such a reassurance and a welcome sight. And they are holding hands. They loved each other. A lesson in life in just 10 photos. There’s one picture that makes me happiest of all. It is the one where Charlotte sits holding a baby- my grandfather, Ted Foulds- and is surrounded by her family. She is smiling. Her happiness and contentment shines out from the page. A great relief to me. I just wish I could tell her- we have all copied her example. We’ve continued the tradition. There’s a long line of tenacious and determined women in the family- and we have all thrived on hard work. We are good at finding solutions. So I may be a physical weakling- but I never give up. And I never wait around for someone else to do a job, if I can do it myself. My latest solution to the problem of coping with an unruly garden is the discovery of the new Stihl compact cordless range of power tools. We already have petrol machines- but they are too heavy for me, I nearly wrench my arm out starting them up. Plus they are so loud they frighten me, and the cat, and the cows in the neighbouring field. I was relieved and delighted to find four battery powered machines that I could actually manage- all by myself. Lightweight and easy to use. 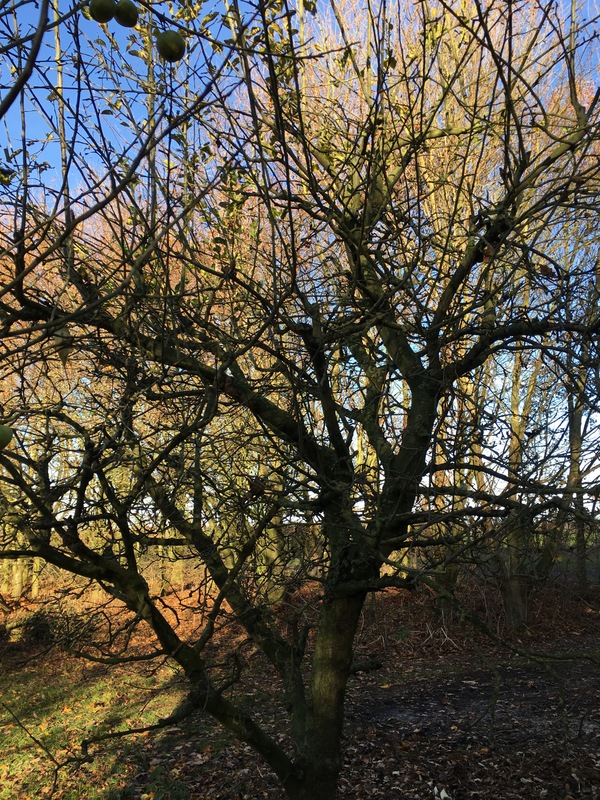 I used the chainsaw to tackle the hazel coppice. Usually I use a handsaw and loppers. 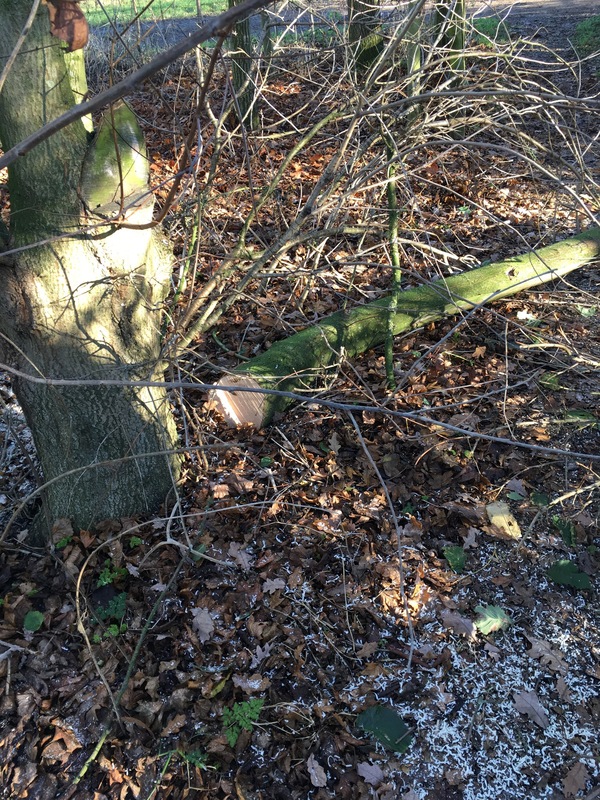 But the Stihl chainsaw cut through them in minutes. 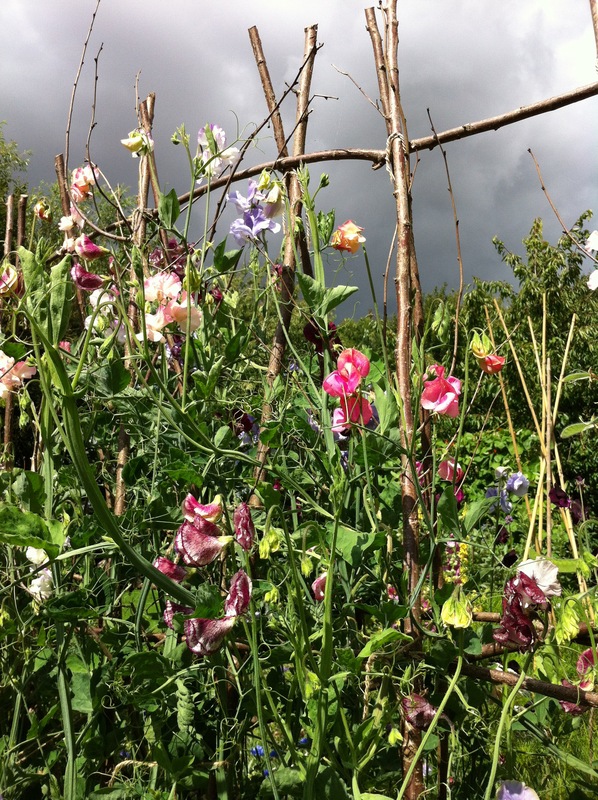 I’ll use the hazel rods to make an A-frame support for sweet peas in the cut flower garden. Next I cut through a low field maple branch that was growing over the drive. The logs will be used on our open fire. 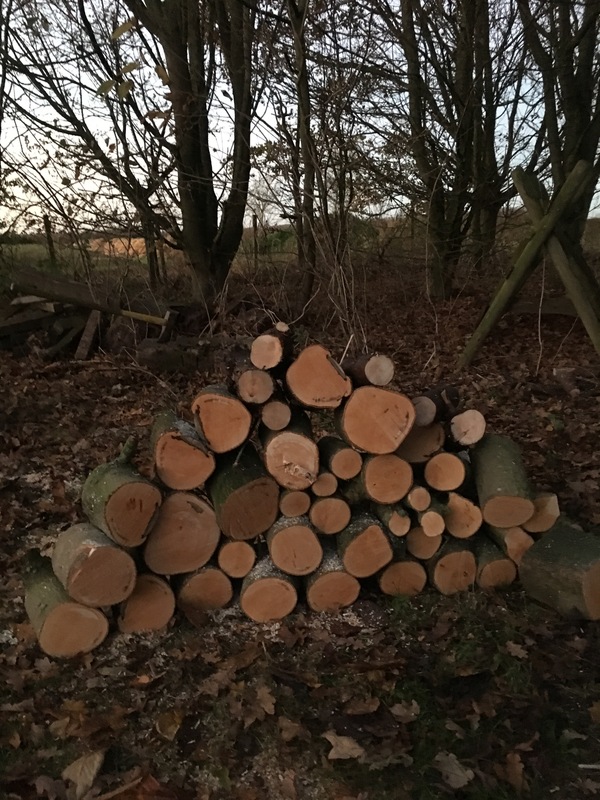 We will leave some brushwood and logs for wildlife habitats. I’m going to tackle the apple trees next. Apple and pear logs are a special treat for Christmas. A gentle flame and no sparks from fruit wood- plus the whole house is scented with a most glorious, exotic perfume. No candles or chemicals can match it. The chainsaw lasted about 45 minutes before the battery ran flat. I was ready for a cup of tea and a piece of cake by then, so I put it back on charge. It took about an hour or so to charge up again. I was busy tidying the logs, so I didn’t mind waiting. 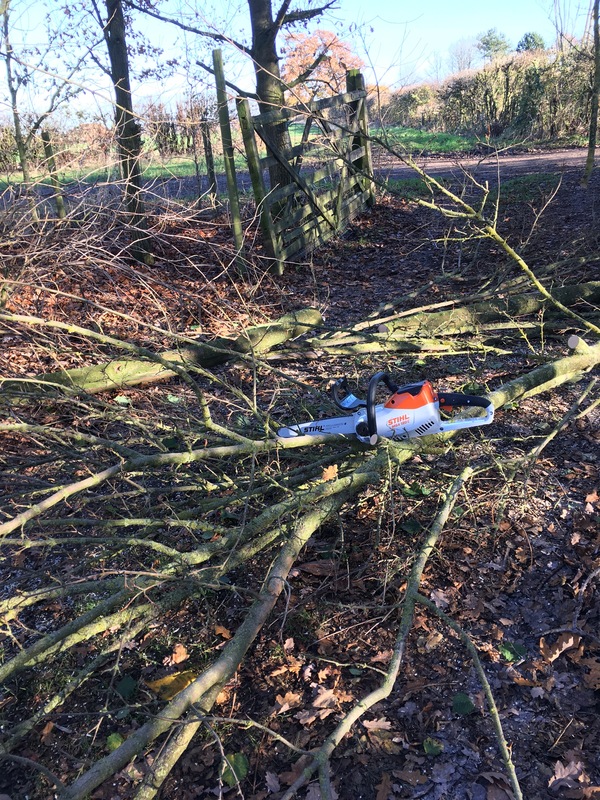 Here are my notes on the Stihl chainsaw MSA 120 C-BQ Compact Cordless Power System. The brochure says the chainsaw is ideal for garden maintenance, cutting firewood, shrubs and branches. 2. Sound Level 94.0 dB A. Amazingly quiet. No ear defenders are needed. This is a good because you can be more aware of what’s going on around you while you are working, if you can hear. 3. Battery Life : The brochure says up to 35 minutes. Mine lasted 45 mins. 4. Cutting Performance: Up to 100 cuts in 10cm x10cm square timber. 7. Quick Chain Tensioning: Tensioning the chain without tools by turning the adjusting wheel. Even I could do it. The guide bar is automatically secured by tightening the sprocket cover. 8. Safety Feature: I liked the pop out battery, which meant you couldn’t accidentally switch the chainsaw on whilst carrying it around. I chose Farol Ltd at Hinckley, Leicestershire, to commission the chainsaw. Special mention to Sarah Nottingham and Jacob Shellis who kitted us out with protective trousers, boots, gloves and glasses supplied by Stihl. They took such care to show me how to use the chainsaw, and the hedge trimmer, strimmer and leaf blower in the range. I was impressed by their knowledge and the time and care they took to explain everything in terms I understood. I feel as if I have a good back up team there. I can ring or go back and visit at any time if I have any problems or need advice. Safety is a prime consideration. I did an assessment of the work I planned and double checked my capabilities before starting. I will still need a qualified tree surgeon for larger projects in the garden. Chain saw and other machinery courses can be found at Brooksby Melton College in Melton Mowbray, Leicestershire. Have you found any solutions to your gardening problems ? I’d love to hear them. Good to hear. There are ways to keep gardening. I like that these tools are relatively quiet and all the safety precautions. Most encouraging. I sure enjoyed reading your post. I also come from a line of strong women. that’s really informative. Battery tools have come on a long way in a short time. I may invest in a leaf blower for removing leaves from the gravel around the garden, raking isn’t very effective or all the gravel also ends up in the leaf compost. Hi Christina, I can highly recommend the leaf blower. It’s about the same weight as a handbag and sounds no louder than a sewing machine, if that’s any help. It didn’t scare the cat, or all the birds I’ve encouraged into the garden, including the pheasants hiding from the shooters. I’ve used it to clear the gravel paths which we have everywhere as they were cheap to lay. Mine were getting lots of weeds growing through the leaves which got worked into the gravel over winter. Also my border plants were getting smothered by leaves. It’s difficult to rake them off delicate plants. Thanks for taking the time to comment. Thanks, I’m sold on the idea now. I don’t like noise of petrol leaf blowers and they seem a bit silly when used on places where you could take or sweep but on the gravel and the borders it would be much more efficient. [D] Well, Karen, this is a very interesting read. I have same height and stature, and these days I also have dodgy knees etc. When we first came to Uist we bought a 20″ diameter rotary petrol mower which seemed about right for the lawns ad broad grass paths of our half acre garden. Great for up and down stripy lawn-mowing, but our garden is more edges and turns than expanse. As the years went by, manouvering the beast became a real struggle. I handed the job over to J (once he wa at home more reliably) but even he struggled. At the time, battery power for machinery of this type was in its infancy (very expensive, not as good as it promised), so we bought a mains electric mower. It’s light, easy to move, easy to ‘start’ and almost as powerful as the petrol mower (and almost the same size). However the cable is a … nuisance! IT takes time and technique to manage the cable safely! Thanks to this post of yours, I’ll have to try and persuade J that we should – when this mower gives up – buy a battery powered machine. Thanks for your comments Judy. I think it’s a good idea to look back at our ancestors struggles and see what achievements they made. Life sometimes feels difficult now. I find it hard to keep up, keep pace with new technology, computers, machines. I feel like I’m always being left behind. Others seem more able to adapt than me. Maybe I’m always harking back to a simpler way of life. Thanks again for taking the time to comment. All the best. Karen. An interesting post and good pictures. The first half about your great-great grandmother is fascinating. thank you. I just felt like the garden was getting more and more out of control. It’s a wildlife garden so I don’t want it to look perfect. But I was starting to feel totally overwhelmed with all the jobs to be done. And it’s so frustrating having petrol machines in the garage and not being strong enough to use them. I don’t know who designed the Stihl machines, but they must have had me in mind! If you live locally you could borrow them to try them out. Just looking to see where you are…. Thanks for taking the time to comment. All the best with your garden. Just heard there’s a battery powered lawn mower coming in January. Yay! Can’t wait to try it. Thank you for your kind comments. I was just finding that I was getting further and further behind with all the jobs around the garden. It’s a wildlife garden which means I don’t want it to be too tidy. But this summer, the weeds have really got the upper hand. I was so frustrated to have petrol machines in the garage- and not be able to manage them without pulling a muscle. I don’t know who’s designed the Stihl ones, but they must have had people like me in mind. Thanks again for taking the time to comment. Let me know how you get on. If you live locally you could borrow them to try them out. Just looking to see where you are…. Very interesting post, Karen. I wish they’d do a good battery strimmer but they’re such toys and won’t tackle our sort of growth and I struggle to start the petrol strimmer much to the amusement of hubby. Like you I almost pull a muscle or tear my arm off. Only goes to show that they’re still developed for men rather than women. Great to see that there are women out there who don’t fear hard work. Bravo 🙂 Much to the horror of hubby I also climb trees with the chainsaw and not with safety gear, oh dear. The battery-powered leaf blower sounds like a great idea. Raking just doesn’t work on gravel beds and paths. Thank you for a fun and helpful post, Karen! I so relate to this: “She looks exhausted. And I want to step back through time and give them a helping hand- modern medicine, health care – and machinery.” I sometimes feel this way about my ancestors too. Our lives are so easy by comparison. Although, I miss heavy-duty gardening. My muscles were strong and I felt fit (if sometimes tired). Thank you Cynthia. I’m finding it a rather sad at times experience to delve into the family history. Just last night I sat and cried, I read about one of my husbands ancestors- a young girl only 20, who burned to death on the eve of her wedding. She was trying on her wedding gown -with all her family and bridesmaids around her- when a spark from the fire caught the dress. In her panic she ran out doors, which only fanned the flames. I was right there in the moment with them. It was so desperately sad. I checked, and the bridegroom never went on to marry anyone else. So two lives ruined. People say things were better in the old days. But now I think she might have survived with modern medicine, antibiotics etc. And thank goodness for modern, flame proof fabrics, and fire guards. Thanks for taking the time to comment, and for sharing my journey into the past. All the best, Karen. Oh, Karen. That’s such a terribly sad story. Such a tragedy. What a great post, it seems there are lots of us gardeners in the same boat. I remember my grandmother doing battle with the mangle on wash days and the soapy smell of steaming washing all day long, she simply refused to to use a new fangled machine until she was in her 70s. It’s good to be reminded how easy our lives are these days, thank you. I am not to work in the garden..and yet in four years I have installed marvelous perennial gardens here in my city home by Lake Michigan. I dig with a spade while on my knees, I rake on my knees and on bad days I have been known to garden on my stomach. I love and live for water, the inland seas, sailing, etc but there is peace in the soil. Impressive saw-work! Loved reading about your ancestors, too. Reblogged this on Bramble Garden. You are doing very well. At 75, after a lifetime of strenuous sport, m muscles are fine, but m knees are shot. We now employ Aaron once a week to carry out the heavier tasks. My garden peace and quiet is often ruined by power tools. I can understand old people needing them, but able bodied people can generally do it for themselves and who needs a gym when you can use your own body in the garden! Yes, I agree. Which is why I love these battery powered machines. They only make as much noise as a sewing machine. I used to do everything by hand. But I fractured my spine in a car crash 15 years ago, and now have osteoporosis. So I need lightweight tools so that I can carry on living here for as long as possible. Thanks for reading and for getting in touch. Have a good week. I know they can be helpful. I have MS and am pretty useless at lots of things. I think I just get grumpy at my able bodied neighbours making such a row especially with leaf blowers, instead of a broom. I will find leaflets about quiet battery tools and push them through their letter boxes, in the hope of promoting a quieter world. Karen, you too have your back destroyed! You fractured your spine! Surely you have plates and screws like me; and it will hurt a lot, especially with weather changes. What a coincidence we are just as tall! And we have “spoiled” knees. Thank you very much for telling us about your great-great-grandmother: how they worked from sunrise to sunset. My great-great-grandmother was a Countess and had a lot of servants. My grandmother already had less money and what was left was when my father was five years old. Of course, my grandmother never did anything: she always had a maid, but I would have liked her to be more “grandmother”; and my father and his two brothers were brought up in the best internal schools. My father and his brother studied at the University and his sister married a very well-situated person with a lot of money. As for the garden, I have a gasoline cutter Sthil that when I cut the grass I have to do it twice, because my back and my legs say no. It’s going very well, you do not have to push it almost and it does not make too much noise or I’m used to it. But the pull to pull it off (although it does the first time) destroys my arm. And emptying the plastic container with the cut grass kills me, I have no strength What is very interesting is the battery saw. Memories for your Mother. And take good care of yourself 🙂 Greetings with a lot of love from Margarita. Karen my maternal grandfather was a truck driver for the Army carrying food from one place to another in Spain and my maternal grandmother was the daughter of a miner and when they died they came to Madrid where my grandmother was serving in the house of the owners of Film Studios until he married my grandfather. My mother got a scholarship to study piano at the Conservatory and she was studying for two and a half years, but my grandfather died and had to start working as an assistant in a haute coture fashion house. And I feel almost more proud of my grandmother, who had to raise four children, than of my paternal grandmother who gave it all done. Karen as for you I’m glad that you dared to take your ailments to blogg. We all have problems. And you have no disabilities, you have bad bones. I also have the garden full of weeds because I can not remove them. And that! Everyone does what he can. Let’s thank God we can walk and not have finished in a wheelchair! 🙂 I have learned, after much frustration, that I have my limitations and it is not like before. Now I’m going at a slower pace and with less effort. And there are days that I can not do anything. And that’s not why I’m less than anyone. It’s me as I am at this moment. Karen much encourage and take care of osteoporosis. Memories to your Mother. Greetings with a lot of love from Margarita.